1 Sathorn Soi 3 South Sathorn Road, 10120 Bangkok, Thailand Accommodation. Score from 124 reviews: Superb 9 There are 2 people looking at this aparthotel. 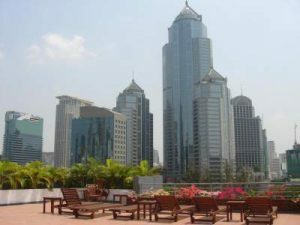 Marriott Executive Apartments Sathorn Vista is conveniently located at the heart of Bangkok. It has a large outdoor pool, 24-hour fitness centre, 3 dining options and offers free parking. Marriott Sathorn Vista is a 10-minute walk to both Lumpini MRT Subway Station and Sala Daeng BTS Skytrain Station. It is also less than a 10-minute walk from the bustling Silom Road. Each apartment has 1 or 2 bedrooms and a separate living room. There is also a fully-equipped kitchen, work space, LCD cable TV and DVD player. Marriott Sathorn Vista also features a whirlpool and a games room with Playstation. There is a business centre, laundry and dry cleaning services. Guests can dine at MoMo Café which serves both Asian and international cuisine. Pool bar offers snacks and beverages and is open for lunch and dinner. Score from 356 reviews: 6.7 There are 8 people looking at this aparthotel. Waterford Diamond offers furnished apartments with a kitchen and free Wi-Fi. A 5-minute walk from The Embassy of The Philippines, the aparthotel features an outdoor pool and fitness centre. Prompong BTS Skytrain Station and Emporium Shopping Centre are both a 10-minute walk from Waterford Diamond. Suvarnabhumi International Airport is a 45-minute drive away. Apartments offer 1, 2 or 3 bedrooms and have a balcony, seating and dining areas and a kitchenette. Private bathroom comes with a bathtub and free toiletries. Other recreation facilities include squash courts. Laundry services are available at a fee. “huge rooms, staff helpful, amazing pools, amazing gym nice location : 8 min walk from prong phom BTS station” Bangkok Holidays. Score from 82 reviews: Good 7.8 There are 2 people looking at this aparthotel. Located in the centre of Bangkok, Tonson Residence offers spacious accommodation with free Wi-Fi. 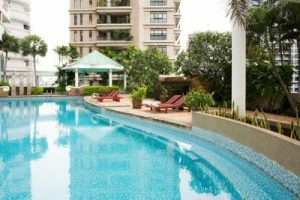 A 10-minute walk from Ratchadamri BTS Skytrain Station, the property is equipped with a 24-hour security system, a pool and a fitness centre. “Lovely complex, massive appartment, really tidy, great value for money” Bangkok Holidays. 235/20-25 Sukhumvit Soi 21 (Asoke), Klongtoey Nua, Wattana, 10110 Bangkok, Thailand Accommodation. 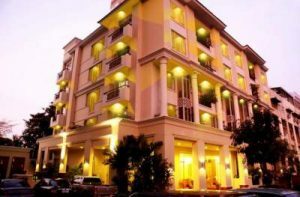 Score from 377 reviews: Very good 8 There are 2 people looking at this aparthotel. Asoke Residence Sukhumvit offers modern service apartments in downtown Bangkok, just 5 minutes’ walk from Phetchaburi MRT Station. Providing free Wi-Fi, it also has an outdoor pool and a fitness centre. Asoke Residence Sukhumvit is a 4-minute walk from the river boat shuttle at Saen Saeb Canal and a 10-minute walk from Asoke BTS Skytrain Station. Via the Airport Rail Link, the hotel is a 20-minute train ride from Suvarnabhumi Airport and a further 400-metre walk away. Fitted with warm lighting and wooden flooring, air-conditioned apartments come with a microwave, a toaster and an electric kettle. A 32-inch flat-screen TV and DVD player are standard amenities. The hotel provides free half-day tours with a choice to visit the Grand Palace, temples or canals. The tours also include a visit to an accredited traditional Thai product store. Laundry services and an airport transfer are available at an extra charge. They speak your language! Apartments/rooms: 52. Bangkok Holidays. 25 Amazing Things To Do in Bangkok, Thailand. Bangkok in Thailand is one of the most thrilling cities in the world to visit. With such a diversity of different attractions and a fascinating mixture of traditional fused with modern culture, the city offers something interesting for everyone. This video includes 25 of what I think are the absolute best things to do in Bangkok. I put together a range of different activities that consist of everything from Bangkok’s zoo, its most revered temples and golden palaces, to the culinary options the city is so famous for. In case you would like to revisit any of these Bangkok attractions shown in the video, here is all the information right below. 1. Wang Lang Market – Wang Lang Market is one my favorite snacking and browsing markets in Bangkok. 2. Chatuchak Weekend Market – One of the most popular things to do in Bangkok is go shopping – don’t miss the Chatuchak Weekend Market Bangkok Thailand. 3. Klong Toey Market – The most vital fresh food market in Bangkok. 4. Floating Market – In this video I visit Talad Nam Bang Nam Pheung floating market in southern Bangkok. 5. Pratunam Market – Shopping is a huge Bangkok attraction and Pratunam is one of the wholesale outdoor markets. 6. MBK / Siam Shopping – One of the most hectic shopping malls is MBK, everything imaginable under one roof. 7. Or Tor Kor Market – Visiting markets is one of my personal favorites activities in Bangkok, and Or Tor Kor is amazing. 8. Dusit Zoo – The Dusit Zoo is one of the most fun things to do in Bangkok if you are with children. 9. Lumpini Park – The central park of Bangkok. 10. Massage – Don’t miss a rejuvenating massage in Thailand! 11. Grand Palace / Wat Phra Kaew – The most revered of all attractions in Bangkok. 12. Wat Pho – Home of the reclining Buddha and the birthplace of the traditional Thai massage. 13. Wat Arun – Wat Arun is the temple of dawn, located on the the Chao Phraya River. 14. Wat Saket – Bangkok’s Golden Mountain Temple with great views. 15. Erawan Museum – A giant three headed elephant which is a temple and museum. 16. Vimanmek Mansion – As the largest golden teak wood mansion in the world, it’s very impressive. 17. Khao San Road – There are lots of things to do in this area, many of them revolving around parties and nightlife. 18. Silom and Patpong – Silom at night turns into a market with Patpong street, home to many go-go bars and fake goods. 19. Victory Monument – One of the transportation hubs of Bangkok and there’s a lot of food, including the tasty boat noodle alley. 20. Eat Durian – Durian, also known as the king of fruits, is creamy and sweet, and it’s the best fruit in the world. 21. Thai Street Food – Eating Thai street food is one of the most rewarding things to do in Bangkok, mainly because there’s so much to try, and so many good flavors. 22. Thai Cooking Class – A cooking class is a great way to learn some Thai recipes! 23. Pahurat – Bangkok’s little India is known as Pahurat. It’s a place to shop for fabric and dine on delicious Indian food. 24. Pak Klong Talad – The largest flower market in Bangkok is a great place to see colorful and exotic flowers all day long. 25. Yaowarat / Sampeng Market – Yaowarat is one of the busiest and most exciting places in Bangkok – don’t miss it! So there you have 25 amazing things to do in Bangkok. Have an incredible trip to Thailand! If you are planning a trip to Thailand and looking for a room on your business trip, holiday or family holiday, you are at the right place. We offer the biggest collection of hotels and resorts in Thailand ranging from budget rooms, boutique resorts, luxury hotels and service vacation apartments at the best deal. Our dedicated professional team are pleased to make your trip the utmost enjoyable time with the fast response. Please let us know your request, we will do the rest. 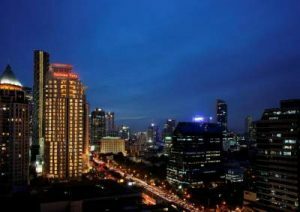 Take A Break Holidays takeabreakholiday, Bangkok Holidays Accommodation.